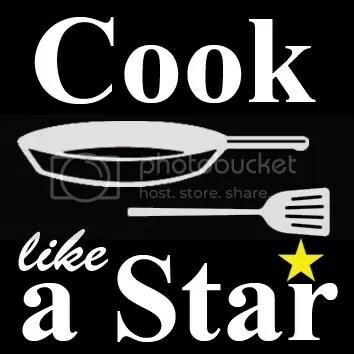 The theme for “Cook like a Star” this month, hosted by Zoe of Bake for Happy Kids, Anuja of Simple Baking and Baby Sumo of Eat your heart out, is Masterchef (from any country). I have bookmarked so many recipes from Masterchef Australia, so this has been a good opportunity for me to go through them. The Beef Stroganoff with Pasta dish was the challenge for the pressure test in Masterchef Australia 2010 where the contestants had to recreate the dish (including the pasta) without any recipe! Most of them did a good job except for one (Shanice I think), who did not pick the right spice for the stew. And that spice is Sweet Paprika. I love the pairing of Paprika with meat and I definitely can’t resist such a luscious looking bowl of Beef Stroganoff. I had wanted to cook this dish for ages, especially since my pasta maker has been sitting in the dark corner of my pantry gathering dust. 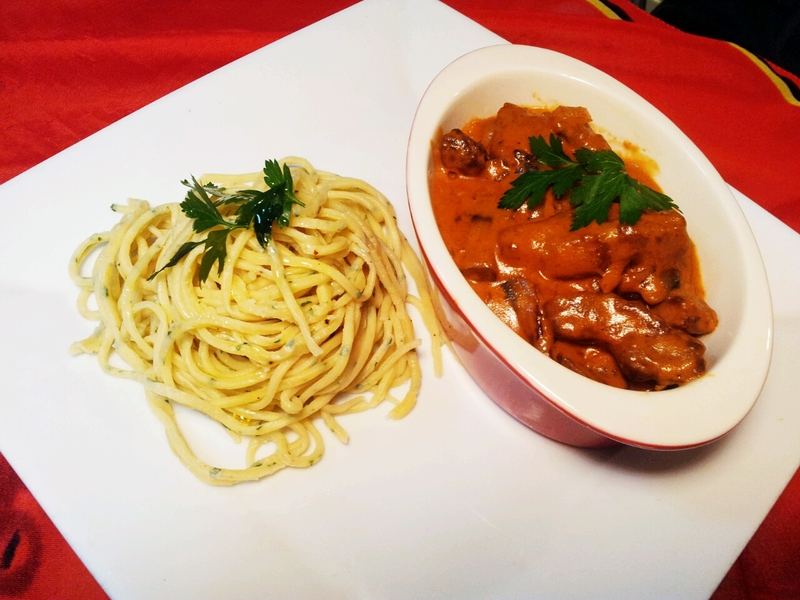 According to the culinary bible Larousse Gastronomique, Beef Stroganoff has been around since the 18th century and was probably named by its French creator after one of the noble Stroganov family. Although it’s said to have come from Russia originally and the first recipe of “Beef à la Stroganov, with mustard” have been published in 1861. It has since become a popular recipe in UK, Australia, China, Portugal, Brazil, Sweden, and even Japan! Traditionally, this dish is served with noodles, rice or spaetzle, this is a modern take with flavoured pasta. Naturally, there are a few changes I’ve made to adapt to our household. Firstly, Frank can’t stand Worchestershire sauce because it has anchovies in it, so I’ve substituted it with HP sauce which has similar flavour profile, minus the fish. I also don’t have Brandy readily available at home (that would be a very dangerous thing), so I’ve used White wine instead. I’ve since discovered that my pasta maker doesn’t seem to want to churn out Fettuccine after multiple attempts, so I’ve changed it to Spaghetti. To make the pasta, place flour, eggs, olive oil, parsley, pepper and a generous pinch of salt into the large bowl and mix (by hand or with a food processor) until dough comes together. Turn out onto a clean work surface dusted in flour and knead for a few minutes by hand until the dough is firm and elastic. Wrap in cling film and leave to rest for at least 10 minutes. Divide the dough in half. Form each piece into a rectangular shape. Dust the pasta rollers in flour and turn to the largest setting. Feed pasta through the rollers, folding the dough into 3 after changing each setting. Roll dough out to the 2nd thinnest setting. Repeat with remaining dough. Hang to dry for 5-10 minutes. For the beef stroganoff, combine paprika, flour and 1 teaspoon of sea salt in a bowl. Toss beef in the mixture to coat. Heat 2 tablespoons of the oil in a large frying pan over high heat and sear the beef for 1-2 minutes or until browned. Remove and set aside. Reduce heat to medium-high; add half the butter and remaining the olive oil. Cook the mushrooms until caramelised. Reduce the heat to medium, add remaining butter, eschalots and cook for a few minutes until softened. Add the wine, tomato paste, stock and bring to the boil. Reduce heat to medium, stir in crème fraiche, reserved beef and juices, then season with salt and pepper if needed. To serve, toss cooked fettuccine with extra virgin oil and garnish with parsley. Here’s my best attempt of plating up this dish as close to the original presentation, I even bought the ceramic dish just for this! 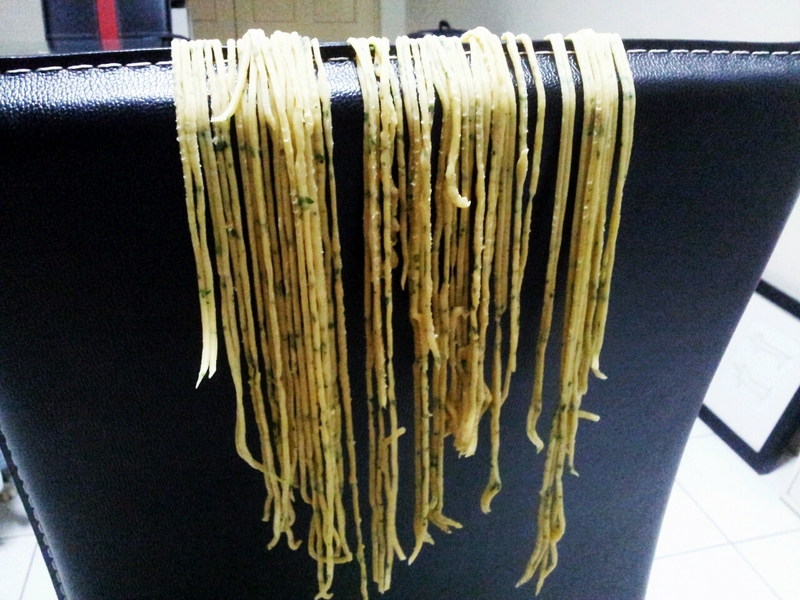 Even though it’s pretty labour-intensive, especially for a novice pasta maker (took me a long time to get the rolling bit done), it’s worth all the troubles and efforts! The Spaghetti was still quite firm after almost 3 minutes of boiling, you could taste the ground pepper and just a hint of parsley. Which is a nice contrast to the super sinful, creamy, buttery, tender beef. I’ve made Beef stroganoff before with a different recipe and it literally pales in comparison. You could definitely substitute the Crème fraîche with sour cream but it won’t be as luscious. Do check out the other submissions for this month! The Circus has arrived in KL! Well done on the presentation! It’s looks delicious :). Never made own pasta before but I think this would have tasted amazing! Thank you! It was delicious and I’m just sad that it’s all gone. Wow, hand made pasta! I am sure it would be delicious! Yes it was!! Took me so long to finally do it but it’s worth it! Definitely not! I didn’t time myself, playing with the pasta maker itself already took me about half an hour (not counting the resting time), but the stroganoff itself was rather quick though. Beef stroganoff is one of my favourite retro dishes from the 70s although I prefer to sear a few pieces of rib eye steaks on a very hot BBQ before cutting it into slices and mixing it into the sauce. I find this method to always yield very tender slices of beef without the need for flour which can make the sauce a little gluggy. That’s an excellent tip! I don’t have a bbq but I think I could just use the skillet… Though I don’t mind the thick gravy myself….. Omigawd!!! Your beef looks stunning! Bet it would go awesomely well with the pasta. Yum! Yum! Yes the pasta goes well with the creamy sauce. Yum yum indeed! Fresh pasta – how awesome! Bet it tasted deelish! The sauce looks so creamy and good, too. Well done! 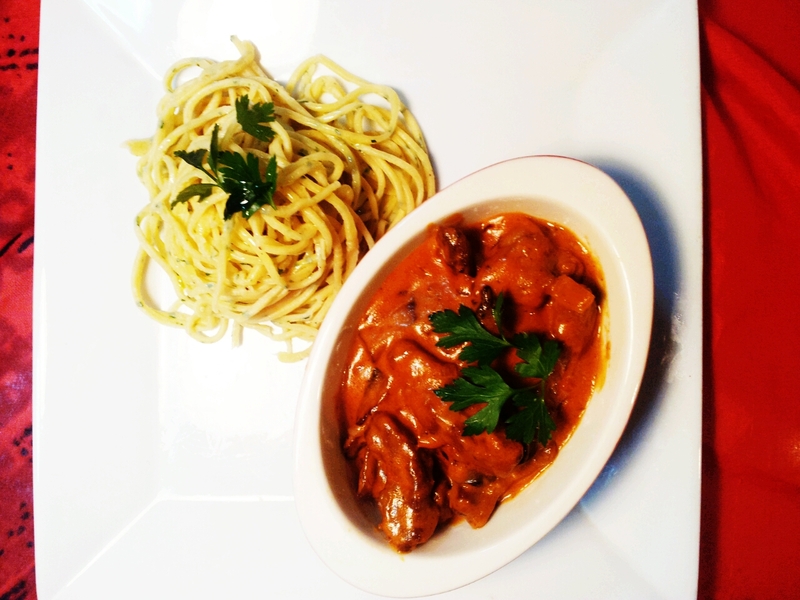 Your beef stroganoff looks very yummy… love the extra saucy texture! 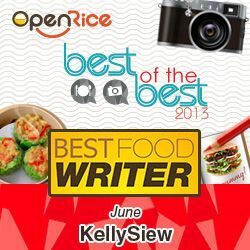 Hi Kelly, A woman who can cook always worth her weight in old…. And your this pasta looks the kind, one mouthful will forget mother’s name. Frankly pasta is not on my food list, but will eat if there’s bean sprouts, ha ha. I love homemade pasta and parsley and pepper spaghetti sounds delicious. Indeed it was delicious! Love to experiment with using different flavours from now on. i’ve on;y eaten beef stroganoff once and that was very long time ago, i forgotten how they actually taste like but now looking at the ingredients, i kind of imaginining the flavours, it looks good to me and you even made your own pasta! they way you laid your pasta on your chair looks like a lacy cloth or a rug! LOL! Must respect the pasta ma! Hi kelly, i’m bookmarking this to make ASAP! looks absolutely delicious, and i havent had beef stroganoff for the longest time! You never stop to amaze me what you can come up with. Wish I could taste your pasta and the beef stroganoff. I could say the same about you!! I’m nowhere as productive as you! Hahaha all gone already wor! Wait til I make the next batch then. Oooo…awesome. That beef stroganoff certainly looks like a sure killer. Slurps!!! Hey Arthur, I thought you have already commented on this post and I scrolled up to have a look….. Lol!